This is it folks, the thing that started it all. The original two airbrushings that graced Star Wars 20-back cards and the art for the display bin header. These three things actually still exist and the sense of awe that overcame me as I held them was unmistakable. They are all airbrushed on foamcore and the fingers appear to be pasted photographs. Actually the Fett figure from the display bin header is a touched up photograph and all of the "swooshes" of the firing missile were added right here. This figure was actually truer to its prototype form, but revised versions of the display bin header had a sticker to cover up this particular photograph. The artist's conception of the Rocket Firing Boba Fett was the one that most of us are familiar with. This figure design was patterned after the original Boba Fett figure that was shown on some Star Wars carrying case inserts and highlighted in an issue of Tomart's Action Figure Digest magazine. 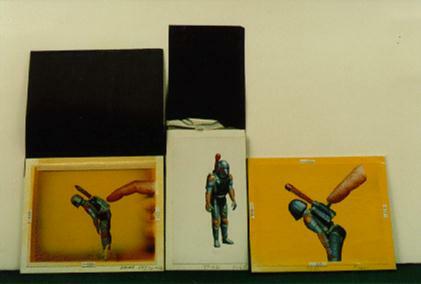 The rendering of Boba Fett with a firing missile (here actuated with a push button instead of the sliding mechanism) was covered up with a sticker on the cardbacks. Many kids had peeled this sticker off only to see this feature that Kenner was covering up for some odd reason. 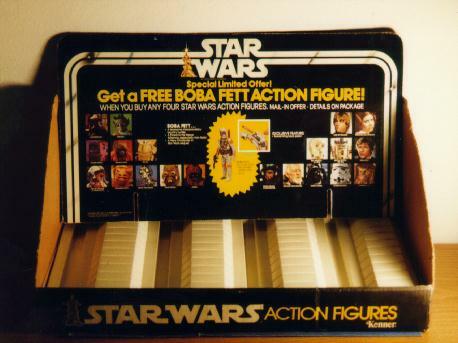 They waited in anticipation for their Rocket Firing Boba Fett to arrive in the mail, but course nobody received one that had the firing mechanism. All that was present was a plain figure along with a notice to consumers explaining the removal of this safety "hazard". Many kids were also surprised to see that the figure itself was different than the one shown here, the one they saw on the figure packages. Like the original character explanation, Boba Fett is truly the most notorious figure to have ever been produced by Kenner. Talk to just about any Generation X-er and you'll see that the legend of the Rocket Firing Boba Fett lives on in all of them.